Who Knew? 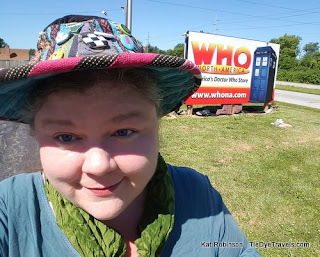 A Visit to Who North America in Camby, Indiana. 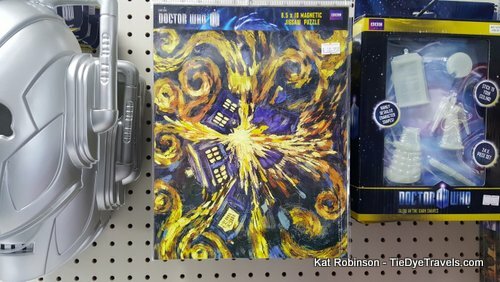 Whether you're a Whovian or a Wholigan, or you just like to dabble in all that's wibbly wobbly, timey-wimey, set your TARDIS to this unique destination in the heart of Indiana. 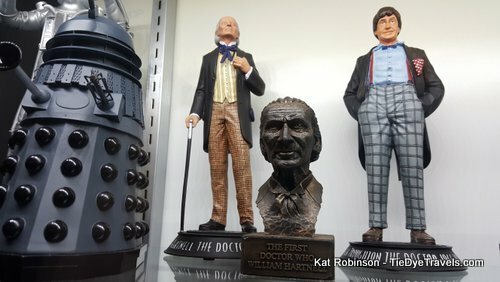 I have to admit, the pangs of jealousy were almost palpable, even miles away, from my Arkansas friends who are long-term friends of the famous long-running British television program Doctor Who, when I posted this photo to my Instagram. 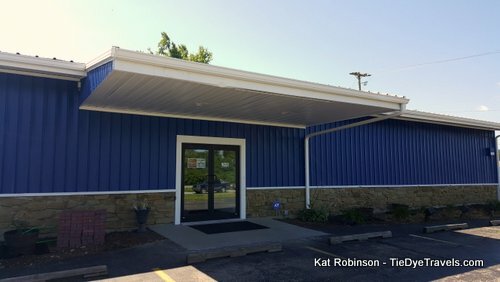 I'd scanned a list of places Hendricks County, Indiana had to offer shortly after arriving, and while many drew my attention (including Rader's Fabrics, Nomad Yarns, McCloud Nature Park and the Royal Theater), this one spun me around and surprised me. I had to message a few people to make absolutely certain I'd read this right. 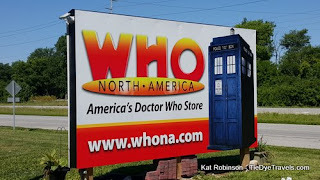 Who North America - Brand new to Hendricks County in 2016, Who North America is the only retailor solely dedicated to the hit British television show, Doctor Who, in the world and includes nearly 5,000 square feet of retail and museum space. Additions planned within the next year include a 3-D viewing room, multi-purpose room that will be used for themed parties, workshops and game nights and an arcade room. Wow. Yeah, I needed to go. Because of the location of everything else I was covering while in Hendricks County, Who North America ended up being my last stop. 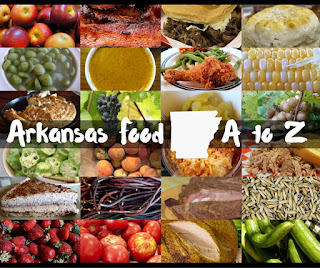 I was heading out of town, ready to get back to Little Rock after 12 days away. 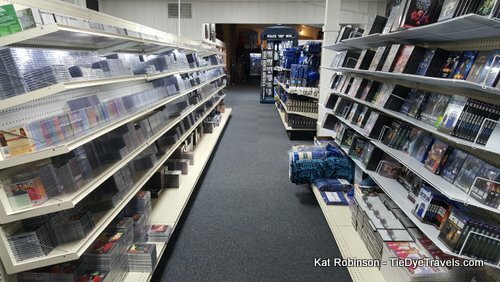 And this great store is on the very edge of Hendricks County. Turns out, it's a brand new facility, but its operation dates back to 1988. 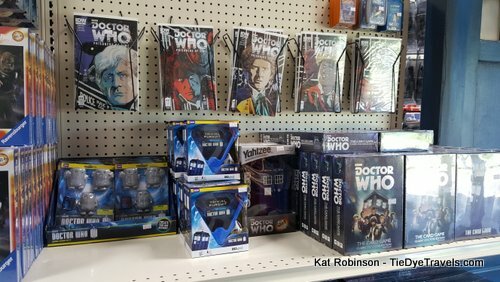 That was the year long-time Doctor Who fan Keith Bradbury began researching UK companies manufacturing Doctor Who products in the hopes of bringing some of those items to America. 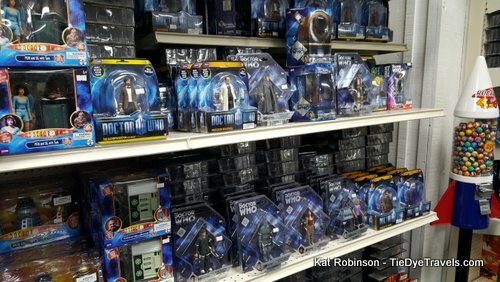 Back then, Doctor Who merchandise over here was pretty rare, and it was overshadowed by Star Wars playsets, Star Trek action figures and the like. Bradbury began with a few items and was overwhelmed by demand, so he brought in more. The internet came along, and the operation went online. 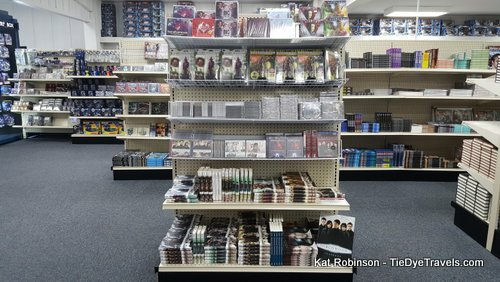 Who North America quickly grew into one of the largest sources of Doctor Who products in North America, and that's before the new series launched in 2005! The entire operation moved into a larger warehouse in 2010, and it was there that the mail-order and internet operation was first opened sporadically to the public for events where customers could come peruse the merchandise, play games and meet other fans of the show. This very year, Who North America moved to this new Camby facility, where it's still under development. 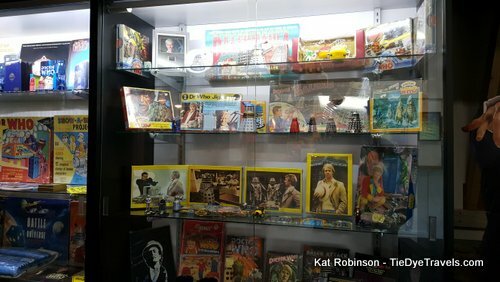 Right now, there's a merchandise floor with a ton of items and a room full of glass cases bearing nostalgic and collectible memorabilia dating back to the early years of the show. There's a museum being developed and a special events area being readied. The idea behind Who North America is straightforward - this is a business dedicated to making everything Doctor Who available to people here in North America, with reasonable prices and quick shipping times. But it's developed into something more. Today, Who North America is aiming at becoming a destination for Doctor Who fans who celebrate the show and their fandom. After all, Doctor Who is the longest running science fiction show in the world. So right at 11 a.m. CST (Indiana doesn't do the whole Daylight Time thing, important to remember when you're planning a trip) on that Tuesday morning I pulled into the lot along State Road 67. I should have known the place would be painted TARDIS blue. 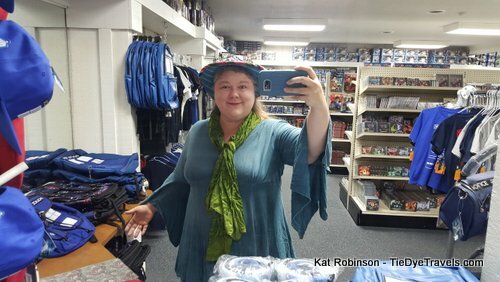 out that merchandise was to the left, historical items were to the right, and a restroom was around the corner. Helpful chap! 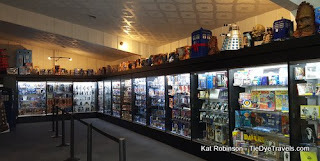 As much as the merchandise called to me, I started with the museum portion, a long series of cases filled with collectible items from more than five decades of Doctor Who. And this is where I stop chattering on so much and just show you these cool things. 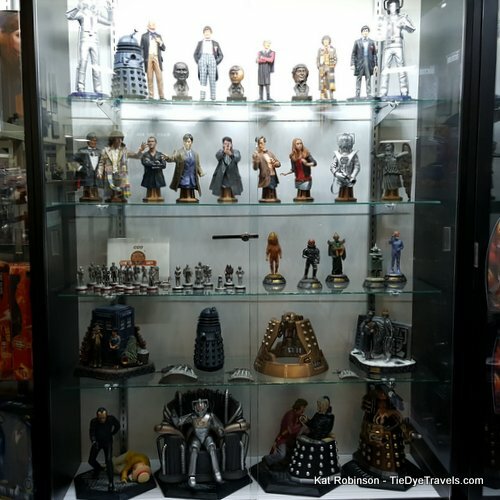 Every single cabinet amazed me with just how much Doctor Who merchandise is out there, and with the sheer historical value of the pieces within. You can tell the amount of deliberate care that's been taken to keep these items intact. 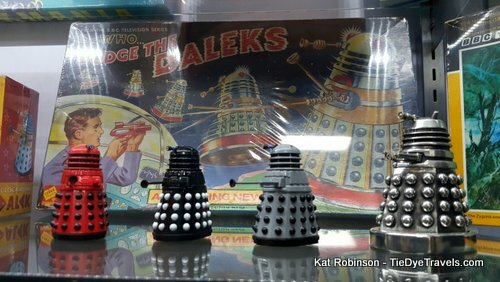 A collector's perfect still-wrapped edition of Dodge The Daleks. 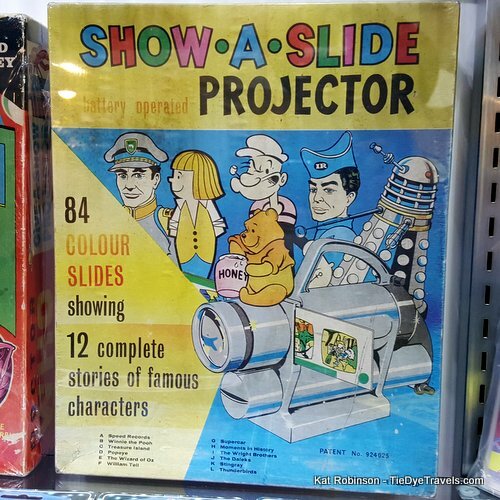 I never thought the life story of Daleks would be as child-friendly as that of Popeye the Sailor Man or Winnie the Pooh, but I was apparently wrong. 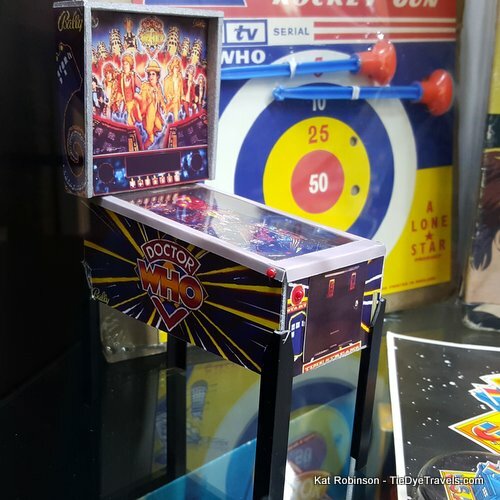 This is just a miniature of the famous pinball game. There's apparently a full sized version somewhere in the back of the facility. I'd love to play it. I adore pinball. 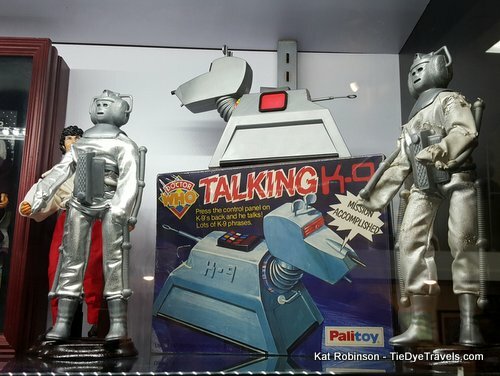 My daughter would go nuts over a real talking K-9. 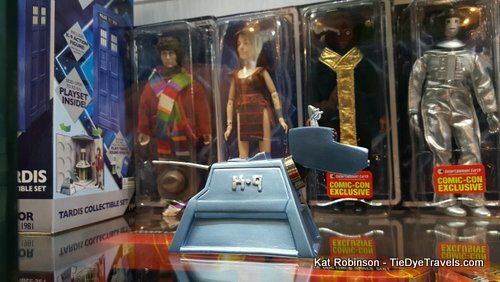 There are collectible action figures from several decades of the show on display. Until Who North America started, most of these weren't available in the states. 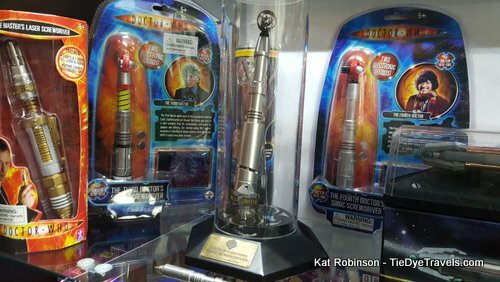 As you might suspect, there's a complete set of replica sonic screwdrivers. 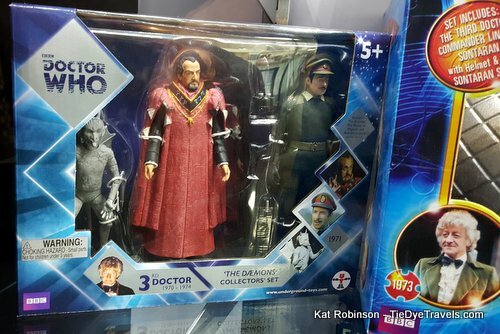 This Third Doctor set for The Daemons doesn't just contain The Master - it also includes the Brigadier. And... hi Brok! 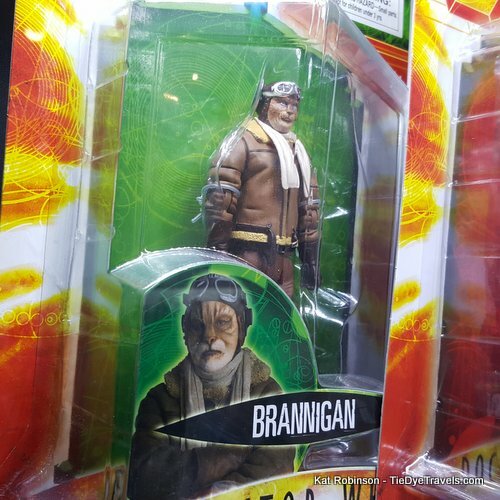 I know I'm in the significant minority here, but every time a new companion is about to be announced, I keep hoping it's Brannigan. Ardal O'Hanlon deserves more acting opportunities! Every case is carefully thought out and set up. There are a lot of tributes to the First Doctor, William Hartnell. 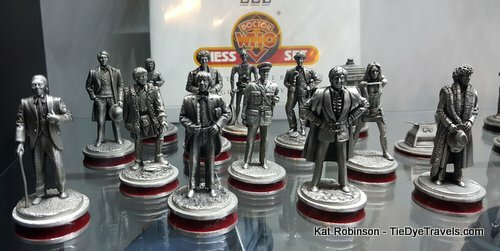 The Doctor Who chess set is interesting, though I suspect difficult to actually use in play since which incarnation would be the rook? The bishop? The queen? Hunter's into American Girl dolls. These are the same size. I'm not sure I'm ready to explain Jack to her. 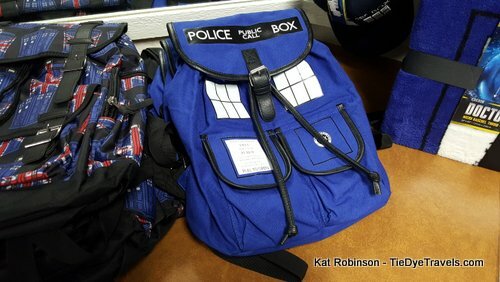 But my daughter's an even bigger Whovian than I am, so I suspect she knows more about the show than I do. Still, I can't let her see these fantastic dolls yet. I'd have to get a second mortgage, I'm sure! 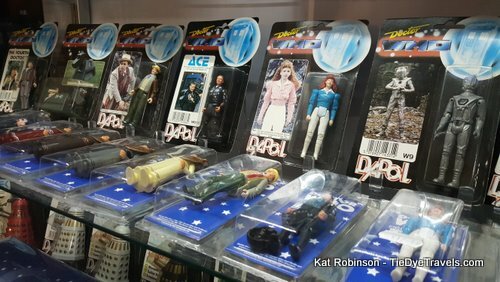 Some of these collectibles are rather rare, including a full set of Comic-Con Exclusives. The attention to detail with these costumes is pretty extreme. 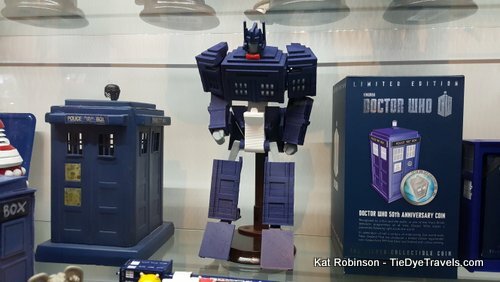 Crossover marketing, such as with this TARDIS Transformer, is probably to be expected. 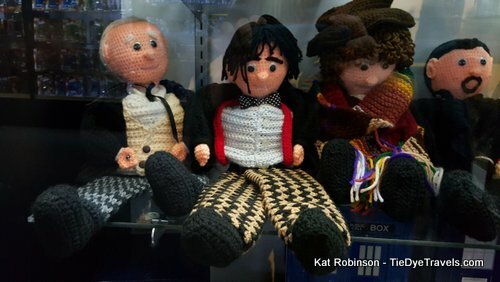 You can't really get more fan-friendly than crochet dolls of the Doctors. 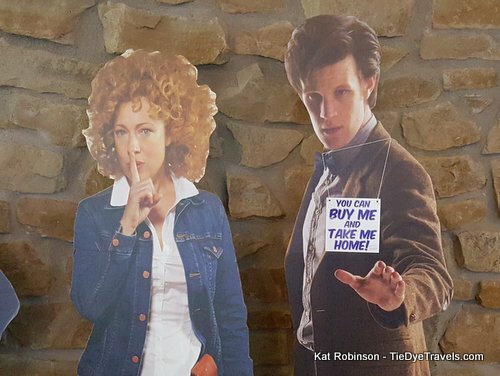 River Song apparently doesn't want you to know that you can have an Eleventh Doctor lifesized cutout in your bedroom. Also, her cutout is a good example of why Strax calls her "the one with the big head." 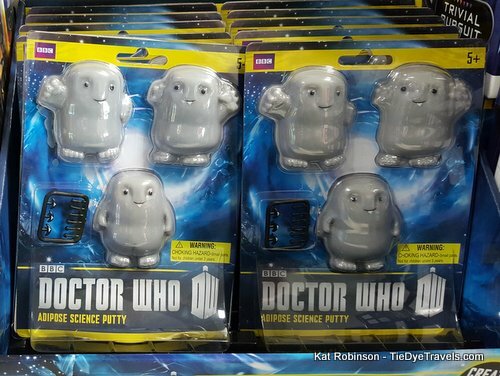 The merchandise section of the store has just about anything you never thought you might need, including this Adipose Science Putty. 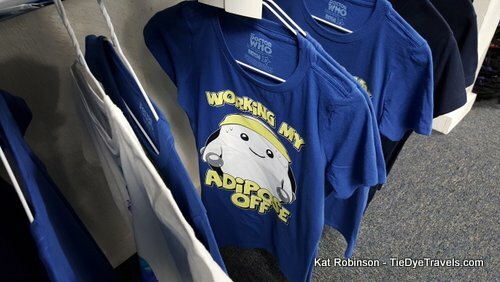 Because Adipose. 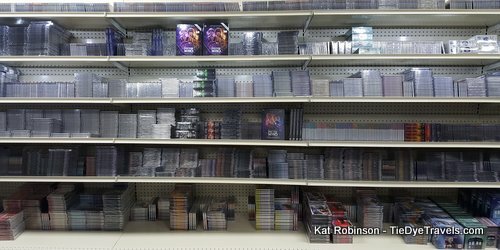 There are all manner of card games, commercial games and such. 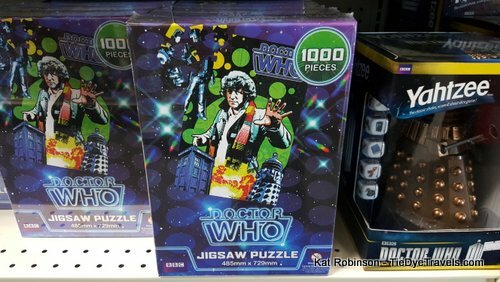 And there are a LOT of puzzles. Some are more difficult than others, as you might imagine. 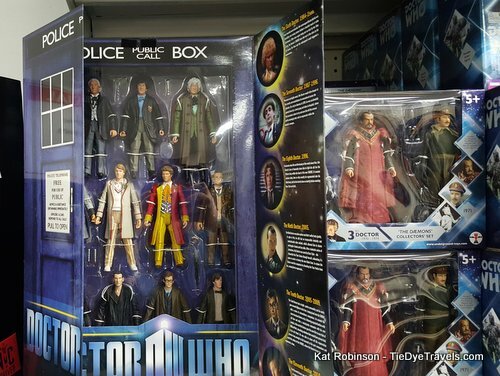 You can collect all the Doctors at once if you like... though this particular box would be about two Doctors short. Yeah, that's a scary mask. 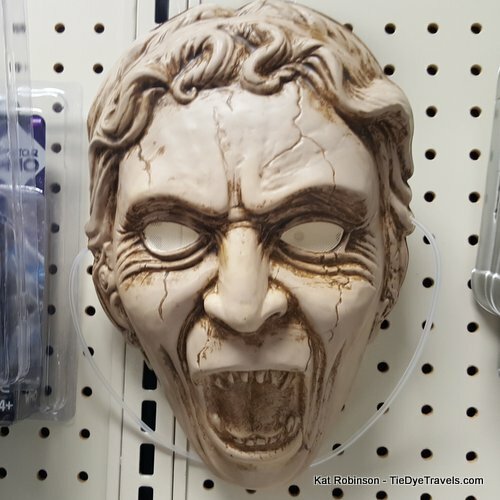 But aren't all Weeping Angels sort of terrifying? Again, so many action figures. They just go on and on and on. 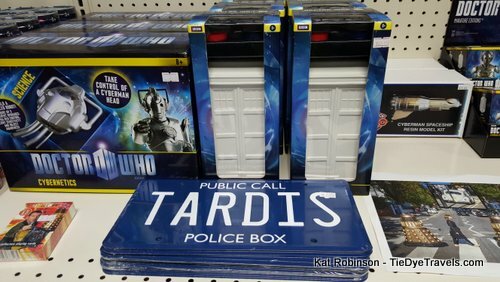 If you need to complete your collection of Doctor Who on DVD, this is the place to do it. 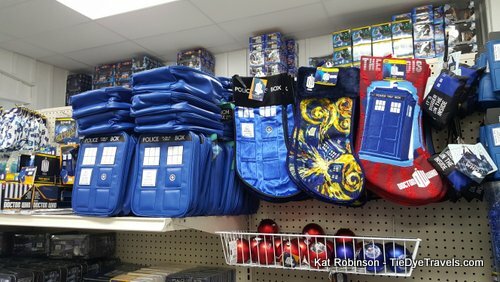 There's just about every episode of Doctor Who available here. 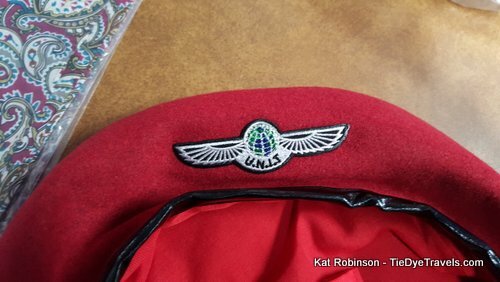 Well, not Mission to the Unknown, but no one has that. 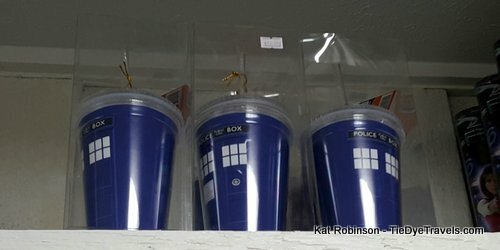 You can control your own Cyberman head, paint your own TARDIS or even run your mouse over a Dalek or two. 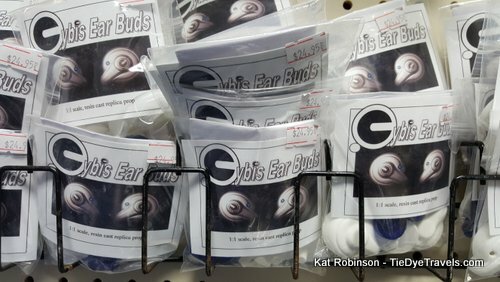 And what's the awesome cosplayer's collection without a set of Cybis ear buds? 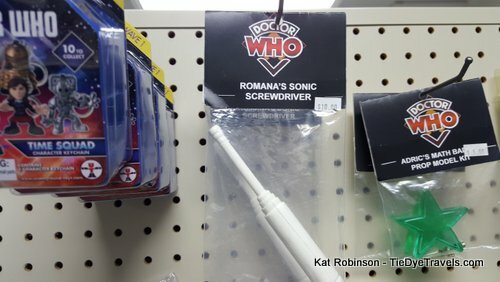 I do have to ask - why is Romana's sonic screwdriver so plain compared to those of each of the Doctors? I mean, seriously, this looks like something between a cake decorating tool and an electric toothbrush. 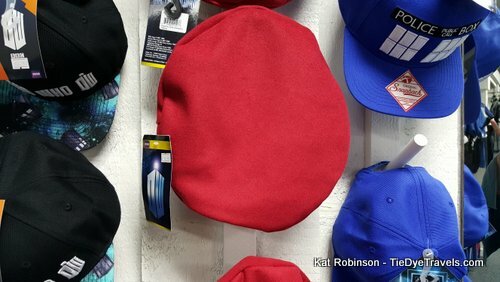 There are fan hats, and then there's this. I mean, I immediately recognized what this was. 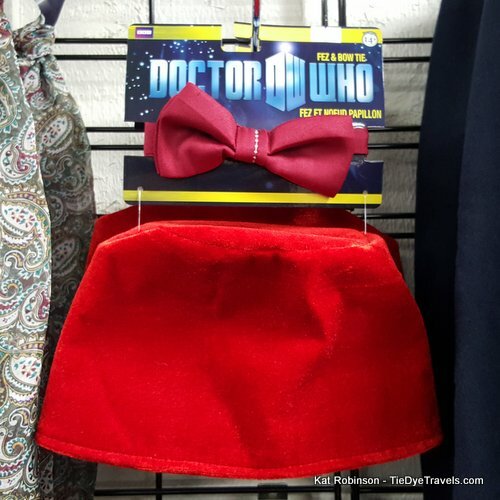 I hate to say this, but this may be the laziest purchasable Eleventh Doctor costume kit ever. 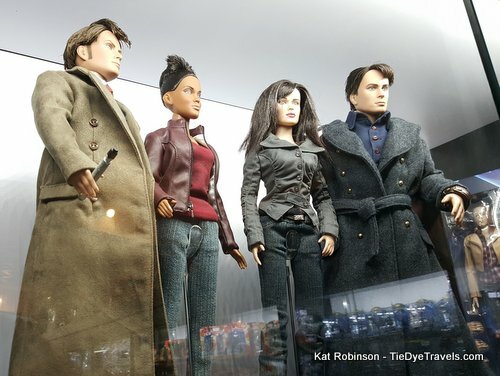 In addition to Doctor Who, there's also a splendid selection of Torchwood items as well at Who North America. Lunchboxes, socks, cell phone covers, Christmas stockings and ornaments... there's not much you can't get at Who North America. There's tons more, including socks and boxers (! 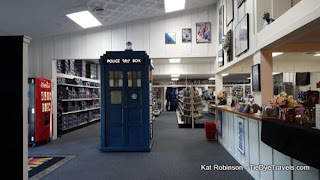 ), books and magazines and almost every sort of Doctor Who item available anywhere. 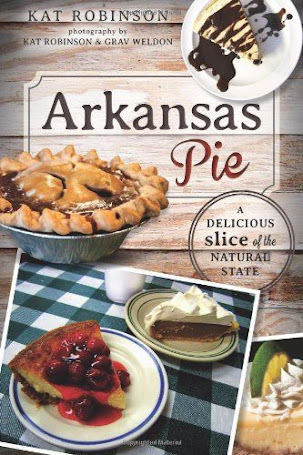 Best part is, even if you can't get to Camby, you can order online. Who North America maintains a particularly marvelous online presence, and since each item's being shipped from Indiana rather than, say, London, it'll get here quicker and with a lower rate for shipping. If you're in the area, set your GPS to 8901 South State Road 67 in Camby, Indiana. 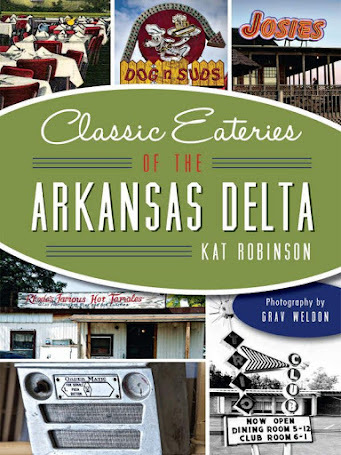 It's a worthwhile stop, and if you're a fan, it's worthy of a significant detour. 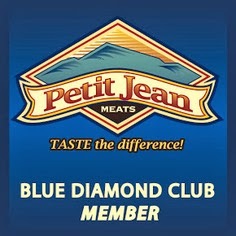 If you need more information or directions, call (317) 481-8189. Allons-y! 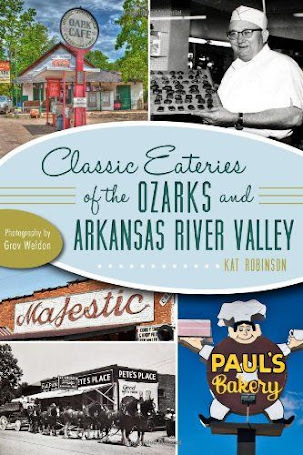 Oh, and while you're in the area, go catch The Elvis at Oasis Diner in Plainfield!